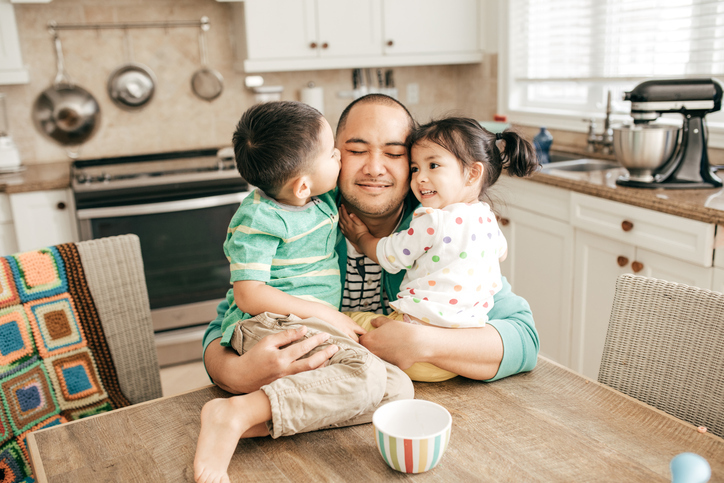 Father’s Day is almost here and we wanted to remind you of all the reasons to celebrate--from dads' uncanny ability to pull a dad joke out of thin air to the special ways they bond with their kids. Play wrestling, running around like maniacs, or tossing their little ones high into the air, dads tend to be the parent less afraid of pushing the limits. It can make some moms cringe to see just how far dads and their kids can go, but we always know that everyone is having fun and will (probably!) be OK in the end. Some mild roughhousing may teach your kids to be resilient and brave, so thanks, dad! Dad, can you make me a sandwich? Dads are kings of corny jokes. Even though we groan and roll our eyes, you know we love it. Keep on being awesome, dads. Whether they’re coaching the whole team or just offering some one-on-one advice on how to play the game, dads are amazing at sharing their love of the game. Football, baseball, and soccer are their usual fare, but we’ve known lots of dads who help with ballet and cheerleading, too. We know it's a little bit love of the sport, but mostly it's love for their kids. There’s a reason that boys are terrified of meeting their love interest’s dad; dads are protective and unafraid of instilling fear in anyone they think might wrong their child. From chasing away the bogeyman to making sure nobody picks on you at the playground, it’s always comforting to know that dad has your back.There is no sound more amazing than your baby’s heartbeat. You can hear the whoosh of the Doppler running over your belly until finally you find it--the fast, rhythmic beat of life from inside your belly. It’s expected that moms-to-be find themselves overwhelmed with emotion the first time they hear it, so don’t be afraid to cry--it really is a miracle. When dad is in charge during dinnertime it can get creative. You know the kids will get fed—but some dads will think outside of the box for meals. Buttered bread and pickles, cereal over ice cream, carrot sticks in peanut butter, or sandwiches stuffed high with every ingredient in the house, dads are great at making dinner an adventure. Every dad eventually receives the dreaded ugly neck-tie. And what does he do? He puts that bad boy on and he rocks it. He rocks it because he loves his kids and isn’t afraid to show it—even if the tie is really, truly, awful. And that's why we love you. We all have pictures of our little ones napping with daddy. It’s hard to deny that seeing a dad napping with his mini-me is about the cutest thing in the world. You can see that your little dude knows that dad is the most comfortable sleep surface around, and that’s why you let them rest, no matter how badly you wish you were the one napping instead. All dads look forward to the day their kids can carry on the tradition. Dads love to have a common interest with their child. It doesn’t matter so much what his hobby is—the day that he can finally share his expertise and have a little buddy join along is a good day for any dad. This one’s a real blessing if you've got a fix-it leaning guy. Sure, moms can fix a toy, change a doorknob, or get a crib together, but do we want to? Nope, not right now. Let dad show off his building skills. It’s kind of hot to see him working hard, plus it sets a good example for kids that you should fix something that’s broken instead of throwing it away. You go ahead and get under the sink to fix the drain issue guys, we’re going to sit back and appreciate your hotness. Dad doesn’t mind a little mischief and he knows that sometimes it’s really okay to not tell mom (as long as it isn’t important or hazardous, natch). Having fun secrets with dad doesn’t make mom the bad guy, but sharing some wild times on the down-low helps strengthen the bond that he shares with his kids. We love that you can have inside jokes with the kids because it means that you’re having just as much fun with them as we are.